You’ll know what’s in it. Canned, pureed pumpkin has been in the news lately because it’s been mixed with other squashes. 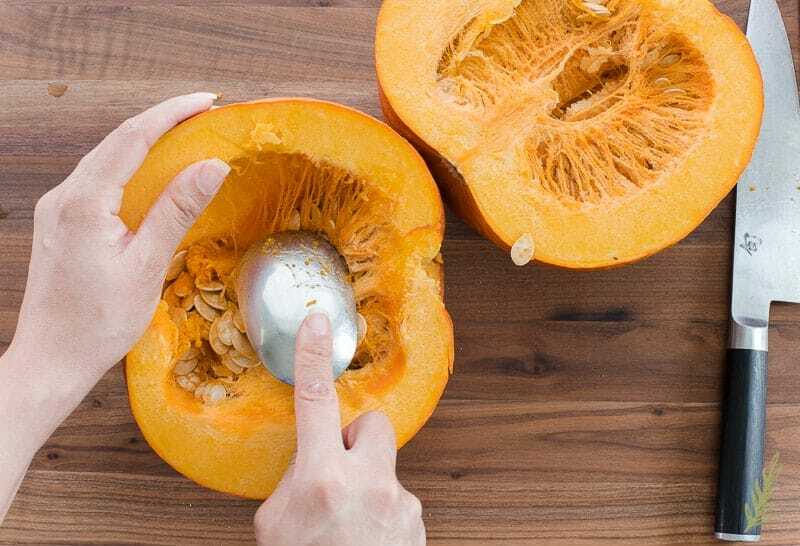 Pureed pumpkin that’s really butternut or acorn squash? Well, that’s not cool! It’s inexpensive. Check out the price of a can of pumpkin puree the next time you go grocery shopping. They’re running upwards of a dollar and seventy-five cents a can; my store was selling it for almost two bucks! It’s easy! In five steps, I’m going to show you how simple it is to make your own pureed pumpkin. There. That was easy. Really. All you need is a pumpkin. Heck, grab two if you feel super domestic. A pumpkin is simply a variety of squash. The preferred type of pumpkin to use, at least for me, is a pie (or sugar) pumpkin. The runner-up is a Connecticut-field pumpkin. Both of these varieties are the hands down favorite for baking and cooking. Their rinds aren’t too brutal to cut through, and their bright orange flesh is creamy and rich when prepared. They’re readily available in most grocery stores, too. Choose a six to ten pound pumpkin and let’s get started. The following is a great way to relieve any frustrations. At first, I wanted to be sophisticated and cut the stem off, but that got old fast. I ended up taking a hammer and whacking it off, instead. Holding the stem in my hand makes it seem like I was strong enough to break it off. But, I’m a weak body, so that didn’t really happen. On a cutting board, cut the pumpkin in half. 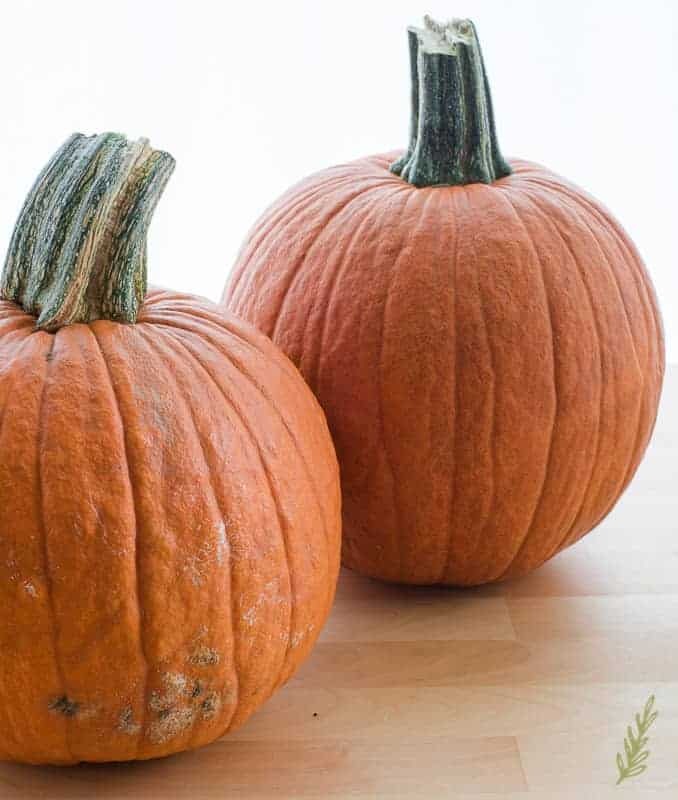 You may need to exert more pressure than you’re used to because pumpkins have a tougher skin than most veggies. I’ve found that using a vegetable cleaver helps with the process. 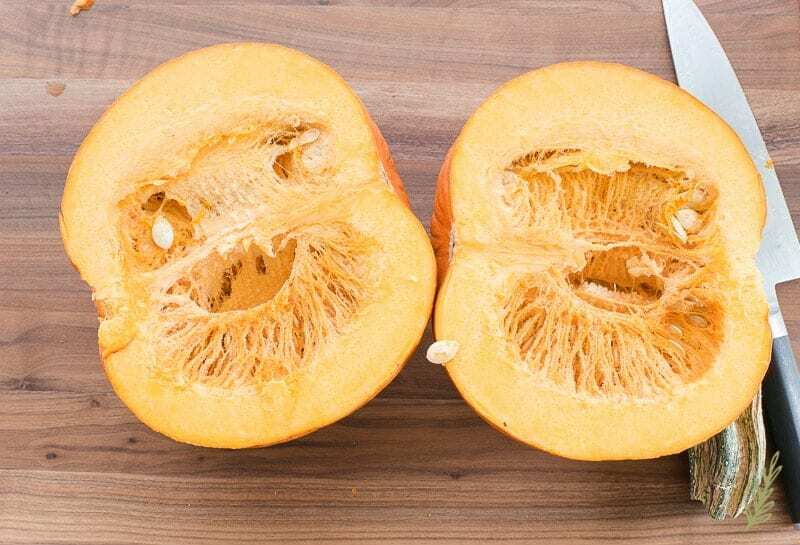 After you’ve split the pumpkin in half, use a wide spoon to scrape out the fiber-laced seeds inside. Make sure the insides are scraped as clean as you can get them. Roasting the fibers won’t hurt (taste-wise), but they don’t add anything, either. You can either discard the insides, or clean the seeds thoroughly for roasting later. 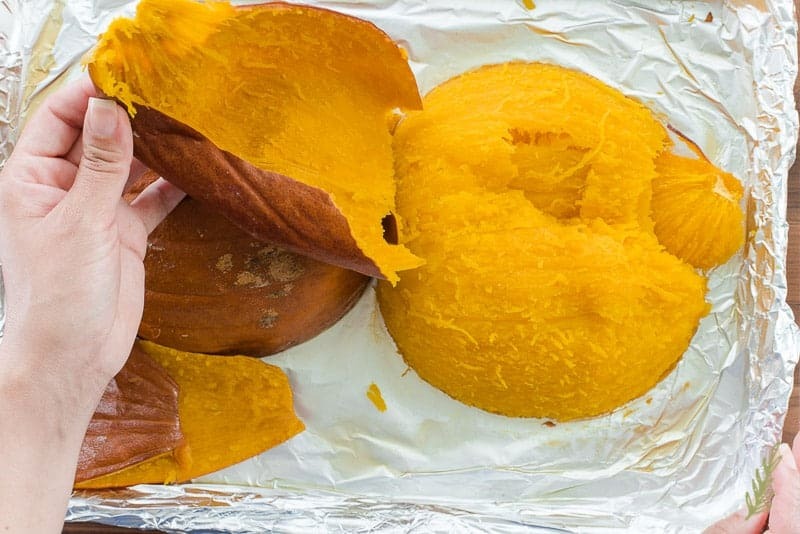 Once your pumpkin have been scraped clean, lay the pumpkins (cut side down) on a lightly greased half sheet-pan lined with foil. Place the pan with the pumpkins into a hot oven and roast for forty-five minutes to an hour. 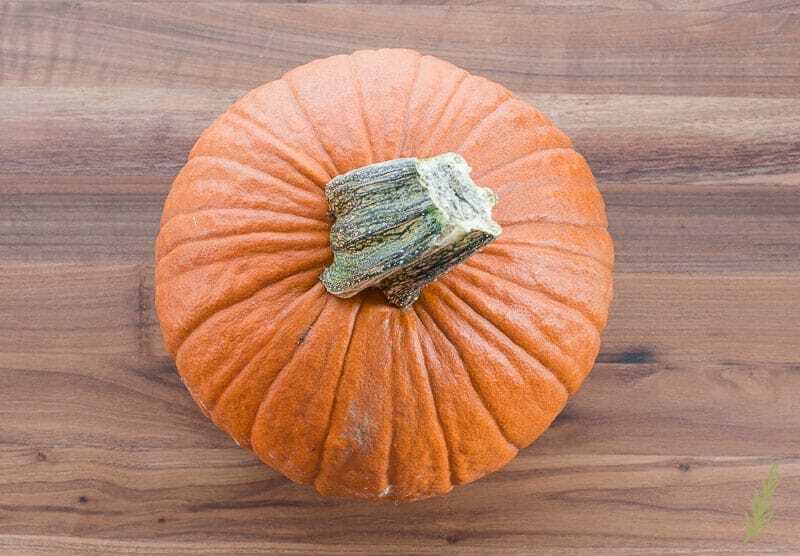 Usually, the pumpkin skin will take on a rust color when it’s fully roasted; the pumpkin will also feel soft to the touch. …you can pull it off. It comes off like buttah! 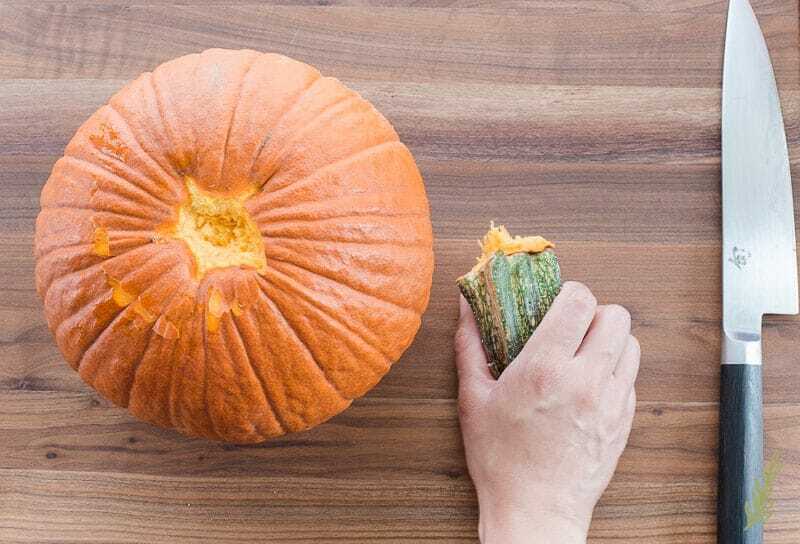 Once you’ve peeled off and discarded the skin, allow the pumpkin to cool completely. This makes the next and final step easier. 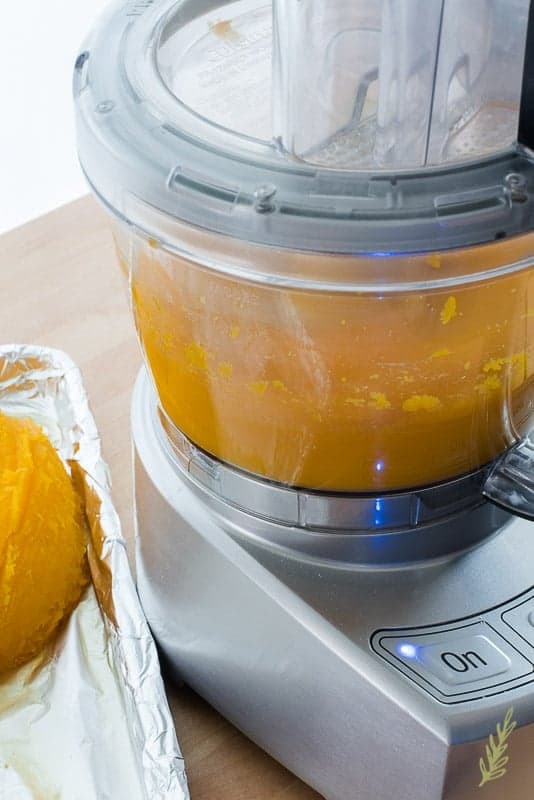 One of the last steps is getting that roasted pumpkin flesh pureed in your food processor. Do it in batches because it makes the puree smoother, as opposed to pureeing a large batch. The greater the amount you’re attempting to puree, the higher the probability of having chunks of un-pureed pumpkin in your bowl. Work in batches to achieve the smoothest puree possible. Now you have about six to seven cups of pureed pumpkin. That’s enough for four pumpkin pies. At less than three dollars for this pumpkin, I’d venture to say the effort was well worth it. 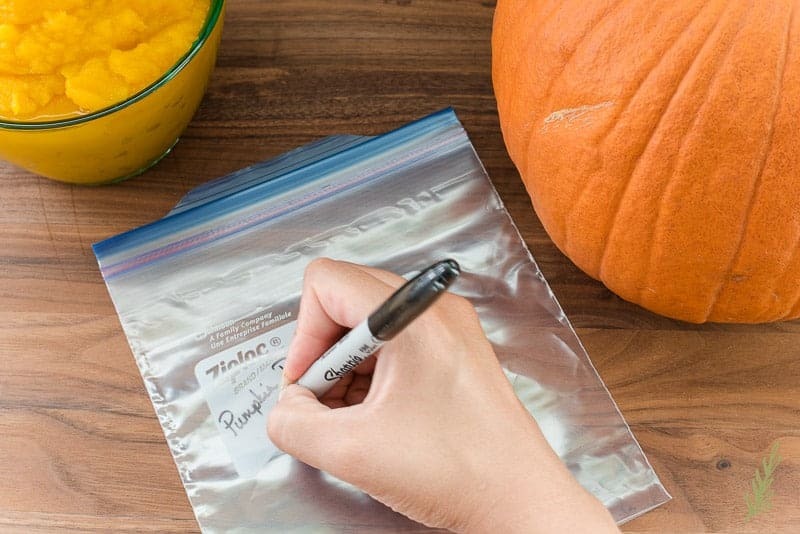 If you don’t want to use your pureed pumpkin right away, pack it into plastic freezer storage bags. Make sure to label them and squeeze out the air when sealing them. Laying them into the freezer flat means that when they’ve frozen solid, they take up little space when stood up. I was able to fill two quart size zip-loc bags with one pumpkin. 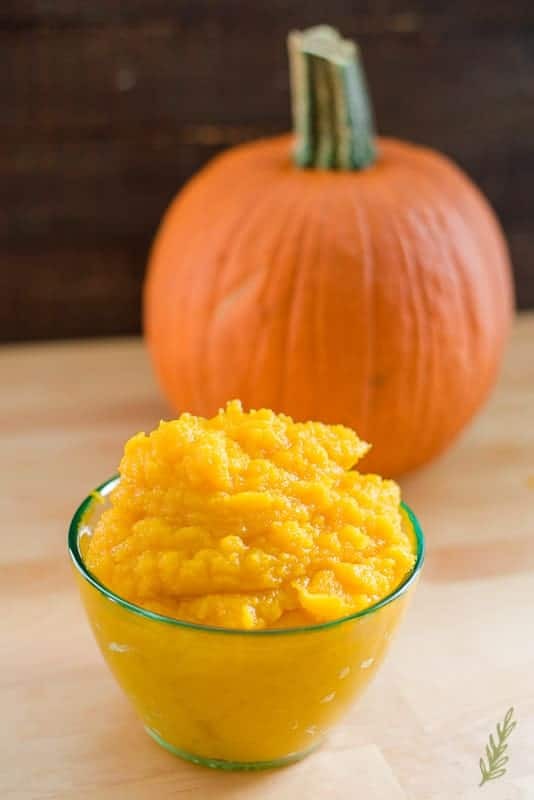 Pureed pumpkin freezes well for six months, so make enough to enjoy throughout the holiday season. Just thaw a couple of hours before you need to use it. Pin this how to and share it with the rest of your crew. Free them from the shackles of canned pumpkin forever! Pureed Pumpkin is so easy and inexpensive- it's a must this baking season! Preheat your oven to 400°F. 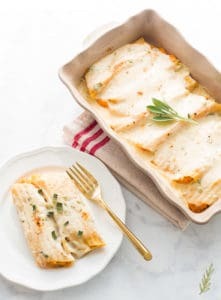 Cover a half sheet pan with aluminum foil (optional) and spray a thin layer of non-stick cooking spray on to the foil (or pan) to prevent sticking. 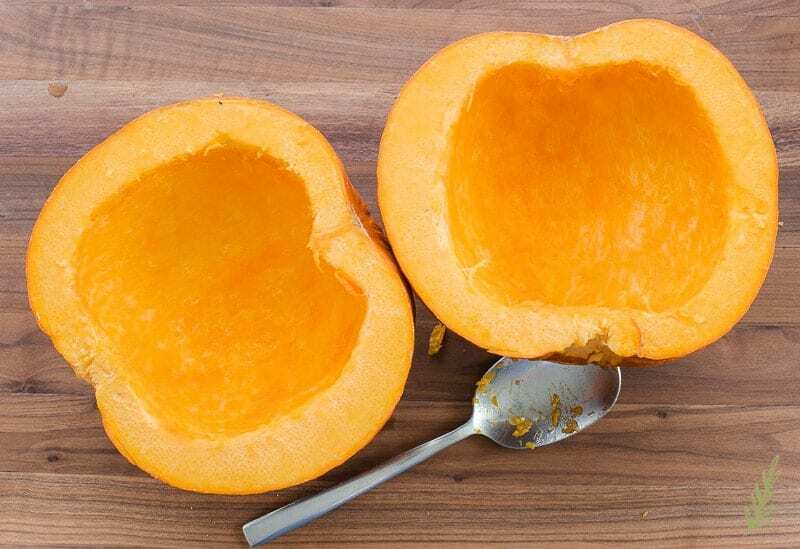 Remove the stem from the pumpkin and cut the pumpkin in half. Use a wide spoon to scrape out the seeds and fibers inside. Discard the seeds or clean them thoroughly for roasting later. Lay the pumpkins onto the pan and roast for 45 min-1 hour. The pumpkin skin will take on a rust color when it's fully roasted and will feel soft to the touch. Remove the pan from the oven and allow the pumpkin to cool for 10 minutes as they are. Peel off and discard the skin, then allow the pumpkin to cool completely. Puree the pumpkin in batches to achieve the smoothest puree possible. 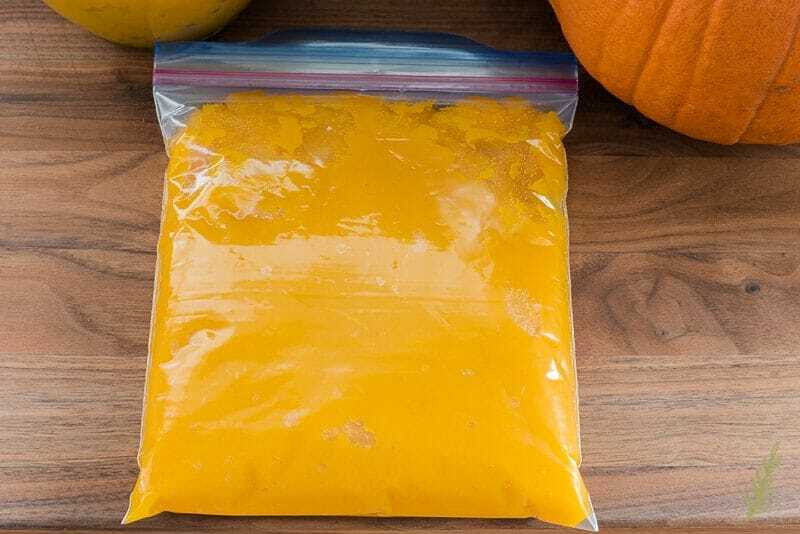 Use your pureed pumpkin right away, or pack it into plastic freezer storage bags and freeze for later use. Pureed pumpkin freezes well for six months. Thaw under refrigeration a couple of hours prior to using in your recipes. Gorgeous photos, I’m totally inspired! 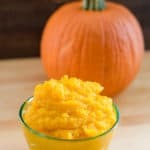 I’ve never pureed pumpkin before but what a great ideas for the holidays. It’s an amazing way to make use of all these pumpkins that flood the market, Jenna! Great tips and so much better than the canned stuff. Thanks! 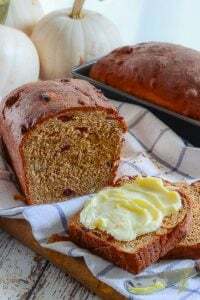 I’ve always wondered how to make this. It looks so easy, I’m almost embarrassed that I haven’t tried to do it sooner. We learn something new everyday, don’t we, Heather! Don’t be embarrassed! I love pumpkin anything. Great idea to make an extra batch and free them. Me too, Evelyn! I freeze a lot of pumpkin because it makes things so much easier.